Los Angeles: Mega Bodega's Sup..
Seattle: The New Visions Espre.. 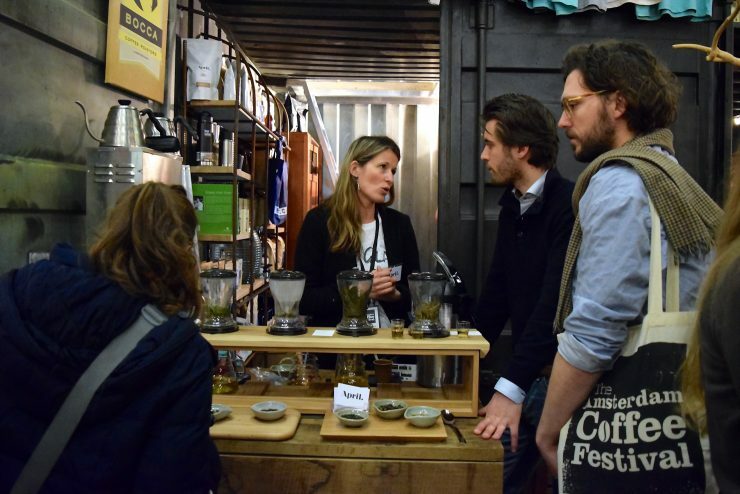 The Amsterdam Coffee Festival was a hot ticket, this year taking place from March 18 to 20 in the Westergasfabriek. The former gas factory is better known in the Dutch capital’s history as a place for mega techno parties, but ACF 2016 generated its own kind of ecstasies, with over 100 brands represented by industry veterans, newcomers, and familiar faces seen in a fresh light. Rob Kerkhoff’s win, just steps from the booth where Keen Coffee debuted the same day, was a grand slam for the new coffee supply and training collective. And if their crystal-clear festival literature is any indication (they gave out a how-to for keeping coffee fresh, a user’s guide to the Phoenix70, and Kerkhoff’s recipe), they’re very capable educators. Co-founder and fellow barista Bonne Postma happily announced that their Brewers Cup-winning natural Colombian coffee from Las Margaritas farm in Campo Azul sold out at ACF. Fortunately, Keen’s other half, Tosca Schuitemaker and Jan Schuitemaker, are roasters. In the VIP suite, away from the hubbub of stands and stages, Amsterdam cafe Scandinavian Embassy served a sit-down three-course food and coffee pairing. This was no avocado-toast kind of affair, but more like—take the second course as an example—scallops flambéed in gin and roasted coffee flowers, served with a pour-over of Lomi Tasha Yirgacheffe roasted by Per Nordby. On brief breaks during the sold-out seatings, chef Rikard Anderrson and barista Nicolas Castagno could be seen doing restorative stretches, à la Williams sisters between sets. Their next match: the London Coffee Festival. Like the first-flush month her tea company is named for, Talitha Czaikowski brought her Persephoneous spirit and usual warmth to ACF. April Tea showcased leaves for summer beverage, such as their Herbal Hibiscus, which visitors could sample as a cold drink paired with dark chocolate, and their umami-noted Sencha paired with Parmesan cheese. Practical, too, was the White Tea, which according to Czaikowski—who is a business partner to Bocca Coffee and the life partner of Bocca’s strategy and development half, Menno Simons—helped cleanse the palate of coffee tastes. “We are not so young anymore but our company is quite young,” laughed Conny Bouwman. Making their festival premiere, she and “business partner and partner in everything” Bernadette van Beek are the friendly entrepreneurs behind Based on Roots. The Nijmegen-based duo curates lifestyle products in contemporary styles that catch the eye and with craftsmanship that convinces the hand. Most must-have were Chanto espresso cups and Milco Handy Coffee Mills, both designed by Takumi Shimamura and available for purchase online . Talk to any serious Dutch micro-roaster and one name is sure to come up: Lennart Clerkx. His fair-value sourcing company This Side Up brought some of the Rwandan coffee producers he works with to be present at the festival and, in so doing, even got diplomats talking. “We decided to create a space where Rwandan coffee producers can get inspired by seeing up close how their coffees taste and look as a finished specialty product,” a Rwandan embassy counselor said of the initiative, as quoted in Rwandan daily New Times. Alongside Clerkx, proud client White Label Coffee served coffee produced at eight washing stations across Rwanda.